John Peter Shindel Gobin (January 21, 1837 – May 1, 1910) If, as has been written by one of the bards, "true history is biography," it follows that to chronicle the deeds and achievements of the successful and representative citizens of a community is but to write the history of that community, and the biographer becomes the true historian. Thus it will be seen that the importance of making permanent record of the lives of men who have contributed to the material growth and development of a community, and have reflected credit and honor upon it, cannot be overestimated. Lebanon County, Pennsylvania, counts among her citizens many who are well worthy of the distinction of receiving extended notice in any volume devoted to the annals of the county, and among all of them stands conspicuously Gen. John Peter Shindel Gobin, the present lieutenant governor of the Commonwealth, who by reason of his long and useful life, his brilliant military record, his distinguished career as a public official, and his sterling worth as a man, has won the admiration and esteem of all who know him, not only among his fellow citizens of Lebanon, but throughout the entire State. Gen. Gobin is a native of Pennsylvania, having been born at Sunbury, Northumberland county, January 26, 1837, and comes of sturdy pioneer stock. His paternal ancestors were numbered among the soldiers of the Revolutionary and other wars of the country, while among his maternal ancestors were ministers of renown. Charles Gobin, his great-grandfather, was a captain in a battalion of Berks county associators, and served in the Jersey campaign in the war of the Revolution during the summer of 1780, and later was on the frontiers in command of a company of militia to protect the settlers from the threatened invasion of the Indians, Tories and British from New York. His grandfather, Edward Gobin, was a soldier of the war of 1812-14. On the maternal side, his grandfather, John Peter Shindel, for whom he was named, was a pioneer Lutheran minister, who resided in Lebanon at the beginning of the last century, removing to Sunbury, Pa., about the year 1812. His son, Rev. Jeremiah Shindel, a noted member of the Lutheran ministry, was born in Lebanon. Prior to studying for the ministry Rev. Jeremiah served an apprenticeship at the printer's trade in Harrisburg, where he had as fellow workmen the late distinguished Pennsylvanians, Simon Cameron and William and John Bigler. Later he prepared for the ministry, in 1830 was licensed to preach, and in 1831 was ordained. In 1859 he was elected to the State Senate of Pennsylvania from the district composed of Lehigh and Northampton counties, serving as senator for three years. In 1862 he was appointed chaplain of the One Hundred and Tenth Regiment, P. V. I., and served two years. The parents of Major General Gobin were Samuel S. and Susan (Shindel) Gobin, the former of whom was a large contractor. Gen. Gobin inherited the martial spirit of his paternal ancestors, and the scholarly characteristics of those on the maternal side. He received an academic education in the schools of his native town, and learned the printer's trade in the office of the Sunbury American. Later, under the preceptorship of M. L. Shindel and Gen. J. K. Clement, he studied law, and was admitted to the Bar in 1858. His early professional career, however, was interrupted by the breaking out of the Civil war, as, upon President Lincoln's first call for three months' men, he left his law practice and entered the army, April 19, 1861, as first lieutenant of Company F, Eleventh Regiment, Pennsylvania Volunteers. At the expiration of his term of enlistment he returned to his home, recruited a company, and on September 2, 1861, was commissioned a captain of the same, which was mustered in as Company C, Forty- seventh Regiment, Pennsylvania Volunteers. Promotion was rapid for this intrepid young soldier, and he was successfully advanced to the ranks of major, lieutenant-colonel and colonel of the Forty-seventh Regiment, and was brevetted brigadier-general of volunteers for meritorious services on March 13, 1865, and complimented in general orders for gallantry at the battle of Pocotaligo, S. C. Besides the latter engagement he participated in those of St. John's Bluff, Sabine Cross Roads, Pleasant Hill and Cane River Crossing, serving in the departments of the South, the Gulf and the Shenandoah. Gen. Gobin was with Gen. Sheridan in his celebrated campaign, during a portion of the time commanding a brigade in the Nineteenth Corps, participating in the battles of Opequan and Fisher's Hill, and particularly distinguished himself at Cedar Creek, where his command was right of Sheridan's line. When a portion of the line gave way from the severe pressure of the enemy's front, which overlapped the Union force, Gen. Gobin held fast, and thus gave the enemy its first repulse, which proved the turning point in the tide of battle. For a time he was Judge Advocate General of the Department of the South, and remained with his regiment at Charleston, S. C., in command of the First sub-district, acting as Provost Judge of that city, until January, 1866. He was mustered out of the service on January 9, of that year. Immediately after leaving the army, Gen. Gobin located in Lebanon, and resumed the practice of his profession, and there he has since resided and followed the law, meeting with a success that has easily placed him at the head of the Lebanon County Bar. The public life of Gen. Gobin has been varied, and uniformly successful and distinguished. Early in his professional career he served for a time as county solicitor of Lebanon county, and this was followed, in 1884, by his election to the State Senate, in which body he served continuously from that year until 1899, an unprecedented term, resigning in the latter year to assume the duties of the office of lieutenant-governor of the State, to which position he had been elected at the general election of 1898. 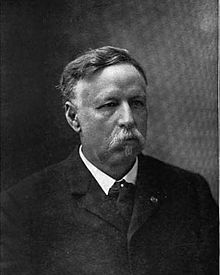 He has served as a trustee of the Soldiers' and Sailors' Home at Erie; as a commissioner of the Soldiers' Orphan Schools; and as commissioner of the Gettysburg Monumental Association. In 1874 he was commissioned colonel of the Eighth Regiment, National Guard of Pennsylvania, and since 1885 he has been brigadier-general of the Third Brigade of the Guard, and commanded in the numerous riots of the State. During the Spanish-American war he held a commission as brigadier-general of volunteers. Gen. Gobin assisted in the organization of the Grand Army of the Republic, and has had conferred upon him the highest honors of the organization, having been elected department commander in 1886, and commander-in-chief of the organization in the United States in 1897. He is an active member of the Loyal Legion, and of the Sons of the Revolution. In fraternal society circles he is very active and prominent; has been Grand Commander of the Knights Templars of Pennsylvania; Grand Captain General of the Grand Encampment of the United States; Grand Generalissimo; Deputy Grand Commander and Grand Master of the United States. In Odd Fellowship he is a Past Grand Patriarch of the State of Pennsylvnia. Aside from his profession Gen. Gobin has various local interests and connections of importance, being a member of the board of directors of the First National Bank, of Lebanon, and of the Cornwall & Lebanon Railway Company, and also solicitor for both corporations. As a soldier, public official, lawyer and citizen, Gen. Gobin has had a brilliant and uniformly successful career. As a young man he abandoned his chosen profession at the threshold, to go to the front and serve his country in her hour of peril with an ardor that patriotism could alone inspire, there to win laurels and fame; as a public official he has displayed wisdom, conservatism and executive ability far above the ordinary, winning merited recognition and promotion at the hands of his fellow-citizens and the State at large; as a lawyer he has won a place at the head of the Bar of both his county and State; and as a citizen, he leaves nothing to be desired. Gen. Gobin is of pleasing personality; kind and courteous to all, of commanding figure and magnetic temperament, he impresses favorably all who come in contact with him. His characteristics are strong and rugged – a stanch friend, a good fighter, but generous foe, warm-hearted and charitable. These are traits which, coupled with his achievements, have endeared him to his many friends and won him the respect and admiration of his enemies, if enemies he has, and where is the man who has impressed his personality upon the affairs of his time that has not?